Transportation in Manitoba, including road, rail, marine, air and off-road vehicles, is the largest source of greenhouse gas emissions associated with climate change. It accounts for 37% of GHG emissions in our province. And the largest contributor within the road transportation sector is the ‘light-duty vehicles’ category – which primarily means passenger vehicles. 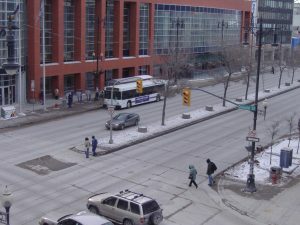 Providing Manitobans with viable opportunities to choose active and sustainable forms of transportation – cycling, walking, inline skating, transit, carpooling and carsharingfor at least some trips is an important step in reducing pollution, addressing climate change, improving personal health, and easing traffic congestion in our communities. And for those times when you need to use your car, fuel efficient driving can help to reduce our impact. One way to ensure our roadways are designed and operated to benefit all types of users safely and conveniently is the concept of Complete Streets. Over 700 jurisdictions in the U.S. have now adopted this approach, with the numbers growing every month. Canadian cities are getting on board as well.